This review first ran in the March 25th edition of The Hamilton Spectator. Maybe it starts with a tweet or a Facebook post. An errant email. A candid comment behind closed doors that’s caught on smartphone and posted to YouTube. A confidential and damning report that’s anonymously slipped to a reporter. However the fuse is lit, you find yourself caught in a crisis. 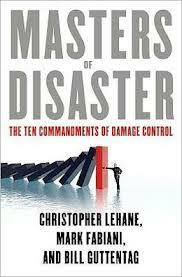 Your credibility is on the line and restoring trust is your one and only mission. So you move into all-out damage control mode. You offer up a heartfelt apology to the core audience who’ll decide your fate. You commit to full disclosure so a real or perceived cover-up doesn’t become the crime. You admit that mistakes were made. You make amends. And you do everything in your power to prevent the same crisis from ever happening again. But you don’t just play defense when it comes to damage control. You should also be ready to go on the offensive and drop the gloves in a crisis. “If you go to bed at night and you are not in a deep hole, and you wake up the next morning to find yourself peering up out of a deep hole, you can safely conclude that someone spent the night digging that deep hole for you – and to their benefit,” say crisis communication consultants Christopher Lehane and Mark Fabiani and journalist Bill Guttentag in their book Masters of Disaster: The 10 Commandments of Damage Control. When a crisis hits, take a hard look around. Are there hidden agendas at play? Who gains from your pain? Why are they stirring the pot and how are they fanning the flames? At some point, self-interested parties will overplay their hand. They’ll accuse you of sins and crimes you didn’t commit. Use provable inaccuracies to undermine your opponent’s credibility and shift the spotlight from you to them. In today’s media environment, it’s virtually guaranteed that every event, every comment and every activity will be reported online, on air and in print. Add the speed at which information moves whether from mainstream media or your neighbourhood bloggers and citizen journalists and crises have now become our natural state. In this feedback loop, it’s not a question of if your organization will get hit with a crisis. It’s only a matter of when. This review first ran in the March 12 edition of The Hamilton Spectator. There’s a foolproof way to pack more punch into your next keynote speech, presentation or report. Serve up at least one “tweetable” moment and the sooner, the better. That short and snappy sentence (on Twitter, you get 140 characters) may be the only thing we remember from your talk, pitch or paper. And if you lead with it, we might just follow along from your first to final word. In the absence of at least one standout sentence, we may never look up from our smartphones or read beyond the opening paragraph in your executive summary. “If you want people to hear your voice, you must be able to convey your message in one memorable sentence,” is the advice that leads off What Is Your One Sentence? by communications consultant and Harvard University teacher Mimi Goss. Against the daily flood of tweets, posts and sound bites, Goss says it’s more difficult than ever to cut through the noise and make your point. “In a world in which everyone is bombarded with messages, you must concisely convey your own message. Goss says some of us run into trouble because we start talking and writing before we’ve figured out what we hope to achieve by communicating. We have no clue what we want or need from our audience. And when our audience figures out that we’re lost, we lose our audience. 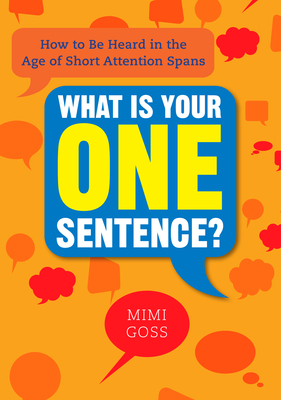 Goss says you absolutely need that one clear, concise and compelling sentence that conveys your most important opinion, decision, feeling, question or directive. It’s a focus that forces you to weed out irrelevant information and overly complex information that muddies the water and leaves us bored, confused and longing for a distraction. Political consultant James Carville would agree with Goss. The Ragin’ Cajun says his job is to help his clients say less and focus more. For Carville, the hallmark of a successful message is simplicity, relevance and repetition. Deliver on all three fronts and you have a shot at stopping us in our tracks. Surprising us. Inspiring us. Provoking us. Holding our attention. Starting a dialogue. And convincing us to lend you a hand, solve a problem or seize an opportunity. Writing powerful, standout sentences takes time, practice and discipline. Goss shows how to make your point by quickly getting to the point and delivering tweetable moments.